MPC-Samples is incredibly proud to present the signature kit to end all signature kits! The legendary and prolific Hip hop and electronic producer Freddy Fresh gives us an exclusive insight into his MPC production workflow with ‘The Fresha Kits’, featuring a blisteringly eclectic sound library of drums, bass and crazy sound fx, ready-to-play kits and a complete multi-sequence MPC & Maschine project! 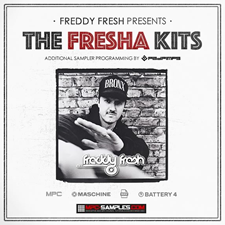 The 278 sound library in ‘The Fresha Kits’ features drums, percussion, bass, vocals, scratches and crazy analog synth fx all handcrafted by Freddy himself, many of which have featured in Freddy’s previous releases. All samples are fully organised by sound type and are provided in WAV and legacy MPC SND format, making the library fully compatible with all models of MPC as well as all software samplers and DAWs. What makes this signature kit so unique is the inclusion of a complete MPC song project created by Freddy himself which gives you first hand insight into the way a seasoned producer builds his music within his MPC. The project consists of a 21 sequence song (song file included), 8 ready-made kits and two bonus ‘beat sketches’, all instantly recognisable as having that Freddy Fresh sound, bursting with plenty of Q-Link and 16 levels craziness - this project is provided in MPC Software Expansion format, MPC1000/2500/5000/500 format and as a Maschine 2 Expansion, with the kits also available in Battery 4 and legacy MPC format. Don't miss out on this very unique opportunity to delve into the mind and workflow of one of the greatest MPC producers of all time - available to download instantly after purchase!